the diamond shape tells the eternal story of womanhood. is a symbol of Eternal Love with no Beginning and no End. Restoring the sacred feminine is rebalancing the Divine Masculine and the Divine Feminine integral to our collective healing. fertility and life force energy like water. the sun, the fire, and radiates the masculine energy. The sun is a symbol of power, growth, health, passion, and the cycle of life. By its lines and shape the Delance watch embodies the values women care so much for. The diamond shape of the watch is a universal symbol of life and prosperity. At the Zenith, 12 0’clock, is the spiral, symbolic of water, the moon, femininity. The infinity knot links the feminine and the masculine in harmony for all eternity. 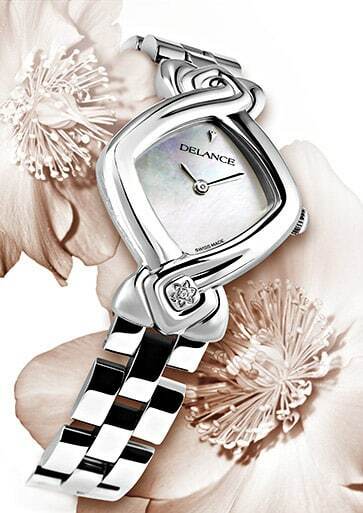 By its lines and shape the Delance watch embodies the values women care for. While the basic shape never changes, the watch becomes unique for each woman. Emotionally personalized, it tells her story, her dreams and her taste; through the choice of engraving and gemstonesset at specific hours, symbolizing the first kiss, the birth of a child, an extraordinary wish, or a special memory. It means being connected to the goodness, aliveness, sensuality and wisdom of the body.